mixed week this week.long days,shorter days,joy and sadness. the joy,had made a break for a cup a coffee (and a snack) and 15 minutes later bacl on track again. 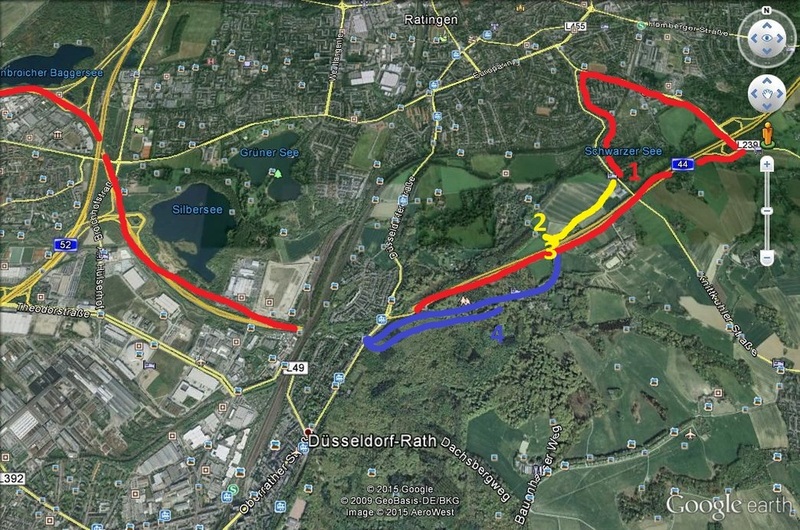 after a few kilometers i was cut off by a BMW and gave me a kind of braketest. i thought DAMN idiot what do you want,look in my mirrors if there was something wrong,nope nothing to see. then the car passinger reaches his arm outside with a sign of ''truckstar''. truckstar is a truckdriver magazine. and take them to a parking place. so after a little interview (i stand there almost 45 minutes) he gave me 100,00 euros ,for haveing the sticker,beeing a member and that i have there ''roadcart'', which you can buy something from there shop or at some truckstops get discount. they pay you 50 for the sticker,75 for sticker and member and 100 for all. i will come in the march magazine. that man use also nikon,and got many cameras. and Friday at the terminal i was driving to the barrier where there is a speedbump to slow you down and report yourself with your cart at the pole. those are so high,that when i go over and brake the trucksuspecion go in and while driving i toched the speedbump. 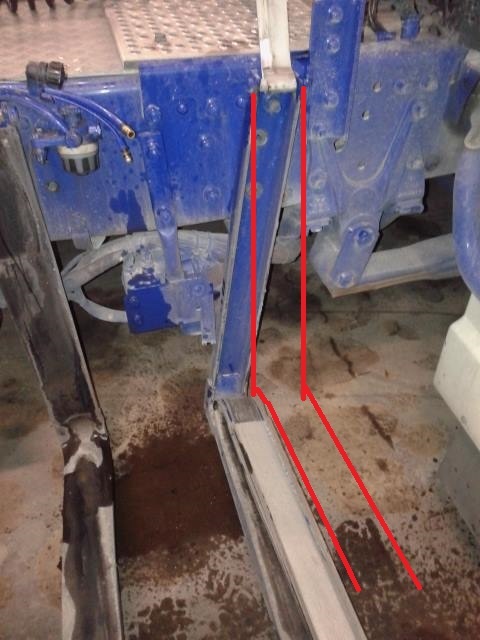 the normal place for the tankbracket,between the red lines. Maybe you should introduce "Troenderhomp" to the Dutch?? What is that??? 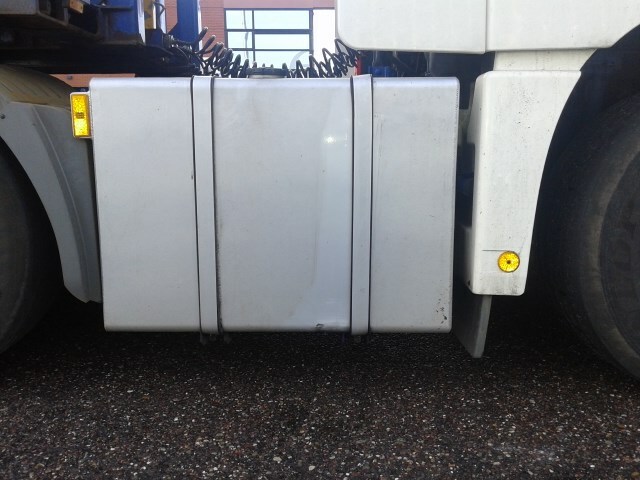 It is simply a part of the speed bump removed at the stander width of trucks. Trucks can get along without being "bounched", but at reduced speed. Normal cars cannot, as they have lesser width between wheels. Simple and effective. won't help,Ombugge,only trucks passes those barriers. the placed them because some drivers came to fast and damaged the barriers. and normaly it issn't a problem,but i got a bigger tank,and low to the street. so drove to the garage for repair. they thought it was just the bar that was broken,and a 30 minut job. so i coild drive inside for repairs. and there at a second look they saw that the whole bracket was push over. my first thought that it was bent,and that i had to drive with it till the end of the HC. 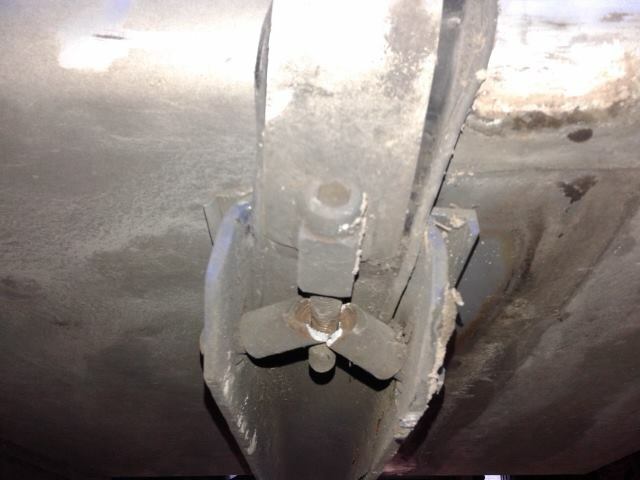 but my luck,the are 3 bolds that mounted the bracket to the chassis. 2of 3 where cut of,so the tank was on that side hanging on 1 bold. to repair that will take some mor time. they had to pump the tank almost empty,remove the tank place the bolds replace the tank back and fill the tank again. al in al i spend 3 hours in the garage,incl there break. Thijs, what a to-do! That's two bad weeks you've had with work. But at least there was that stroke of luck with the borrowed chassis! Be careful with how you spend your interview fee. Wow! You must show us when the March issue come out and I'll keep my fingers crossed that the photo doesn't show the chassis or you'll be in plenty trouble with your colleague! it will be a horreble image anyway,rain,strong wind,and i could use a haircut. 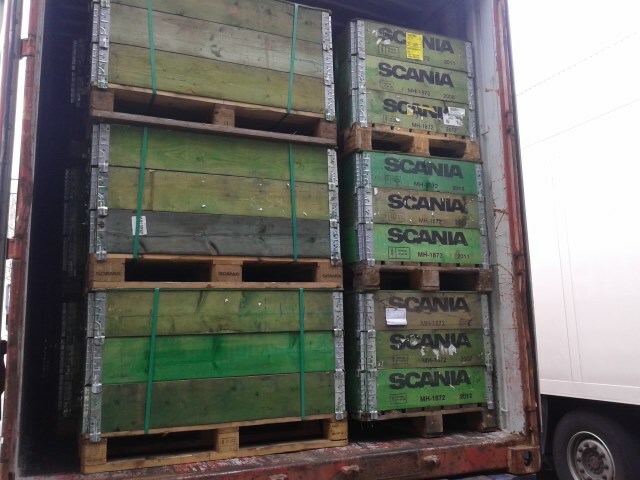 Thijs Vink from Giessen have a container full with peanuts which will be shipped to Norway. Luckly he issnt'in a hurry so we have the time for a talk and a image. For his membership he get 2 biljets of 50 Euro,which violently flapping in the strong wind. He started his day with discharging in Tiel,and dorve to Doetinchem for loading the peanuts. 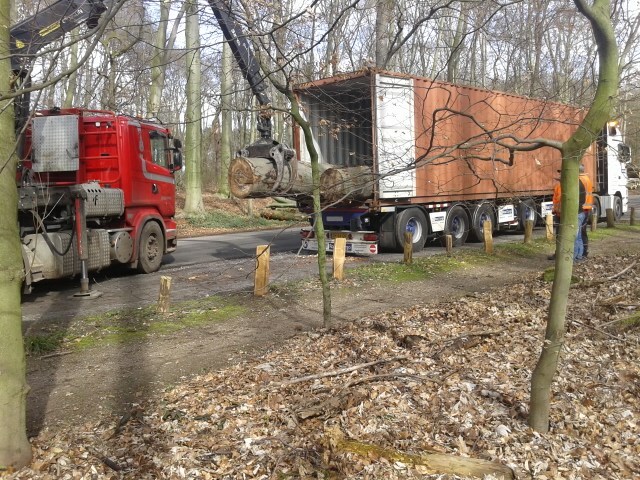 The container will go to Rotterdam and get there another one for destination Roermond. His 100 euro he wants to spend at is hobby, photographing. Thijs, what fun! €100.......and for driving with someone else's chassis which had the sticker on it! I had forgotten all about that, I must admit. Nice photo. Will you spend it on photography - or on more model stuff, I wonder. On second thoughts, you've probably already spent it on all the modelling bits and pieces - the lens converter will have to wait, perhaps. Last edited by wherrygirl; February 20th, 2015, 12:41.
yeah it went to the last fair. had a terrible week this week. 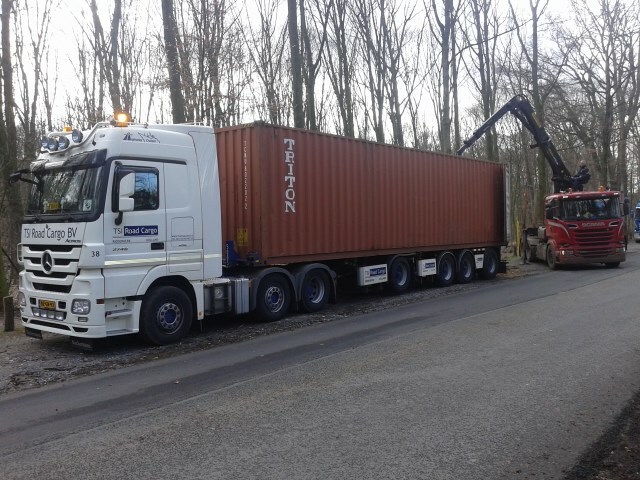 unload a container in Veghel Holland,load it back in Ratingen Germany. arriving there in the neighberhood there where already 2trucks waiting before the street where we had to go in. they had called the lumber jacks where to go.they didn't understand him wel (later the huy arrived and look stranged after i told it him) but they drove about 1 kiometer backward on a small road (about 2,5 meter,the weidnes of a truck) to a big pile of logs. 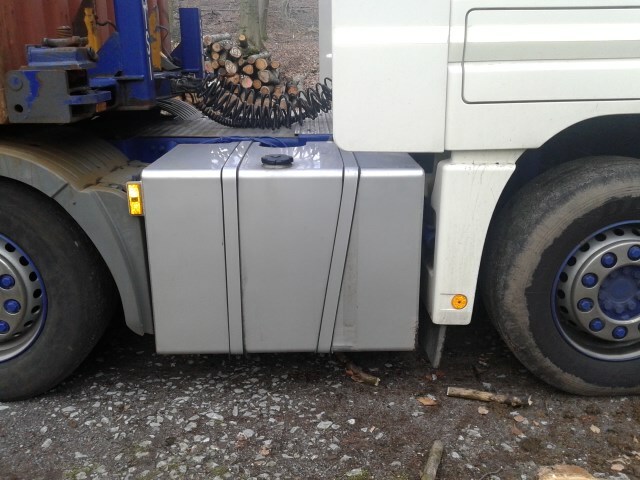 but they were late because of there truck was stock in theforrest to get those logs out.while there was just place for 2 trucks i had to wait. after a while a second third container truck (1from the company which already was there) cam e a turned right away into the path. i waved to him ,don't go,but he wave friendly back. well the lumber jack knows i'm here he would phoned me when i'm on. 15 minutes later a call. the third truck was stock in the soil and no truck or car was be able to go away as long that truck was there,so i had to come to pull him out. 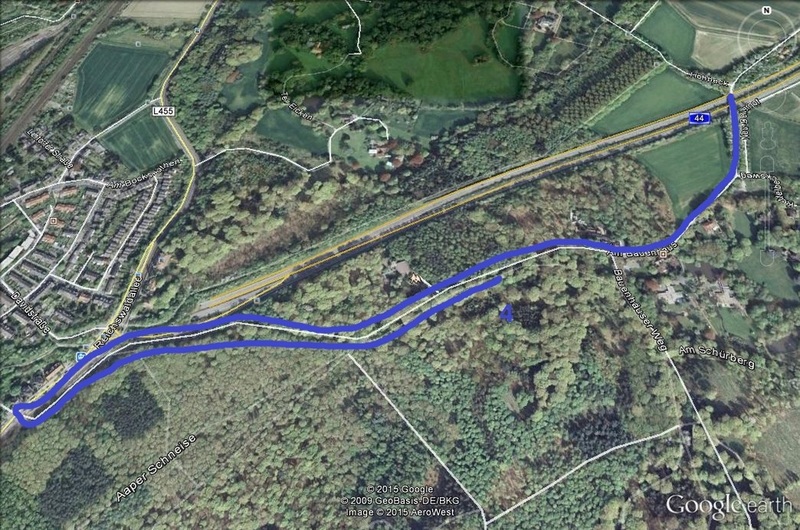 the bleu line ,the road we drove to get away from there turn at the end and parked at 4 were we would be loading now. 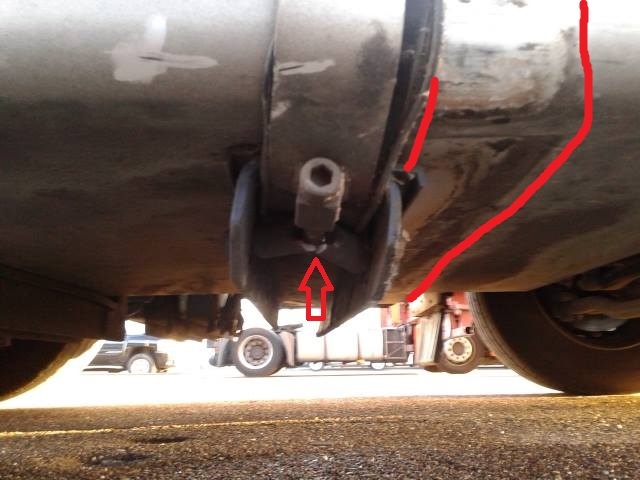 at (3) were the truck was stock in the soil (4) the bridge were i damaged the bracket. now they know it was a bad spot to load they told us to go to another spot ,where we could load. 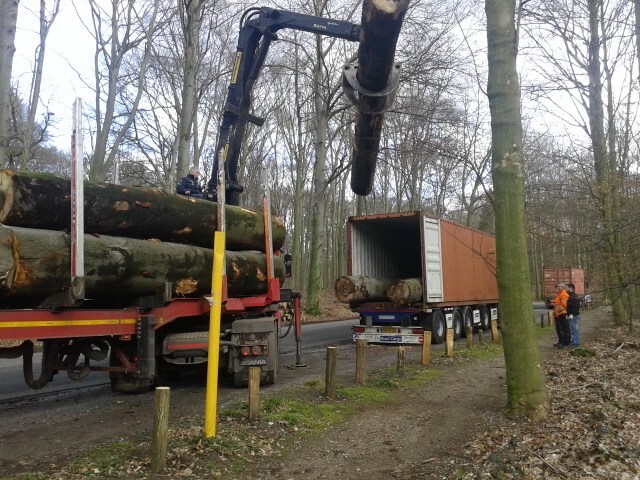 over the bleu line ,turn at the left side of image and come back and load at 4.
still loading here,but at the end i had 13 logs and about 24 tons ,back to Antwerp,to deliver the container. 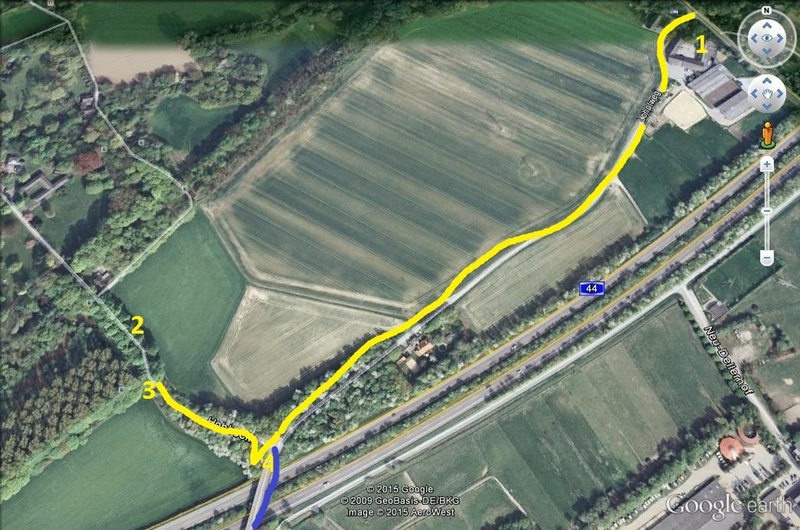 which went well,so drove back to the Belgium/dutch border and parked there for the night. haevy winds that night,and with the wind full at the back of the truck and no container, it was heavely rocking that knight.and not only that the spoiler rattled the whole night through those wind. so not much sleeped that night,went even out ,to see how the roof spoiler was,and still good mounted. drove to the Mercedes shop to see if i could repair the bracket.with the help of a mechanic (i push ,he mounted it tight again) i was on my way to Tholen. arriving there i could park the 2 containers side by side for loading. disconect the 2 parts and saw that the front container was tilting,what the heck? 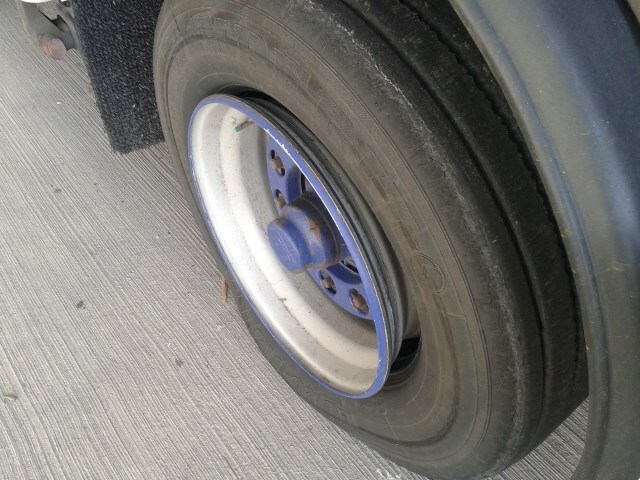 a flat tyre,when was that happend,i don't know,had drove the last days only 40 ft containers so don't need that axle. after a call to the office,i had to go to Bergen op Zoom for a tyre change.just 8.3 kilometers away. after 2 hours back in Tholen ,load the containers and drove back to Rotterdam. but made a call first if i had to go there because of the storm winds. so i parked the truck at the Mercedes garage (not allowed for truckers to park on the street in Rotterdam) at 4,15pm and watch dvd of Castle for the hole afternoon and evening. went to the terminal wednesday morning ,where it was a mess.but managed to deliver on 1 terminal and get other containers on a other terminal for Vlissingen to drop them off there. back to Rotterdam ,pick another container for thursday and finally drove home after 3 days. thursday i discharged empty fish tubs in Urk wich didn't go well,back to Rotterdam. drop that one off and i had to pick up 1 for delivering to the Eurmax terminal (spotting place 1) and go back halfway to rotterdam pick 1 up for the next day. 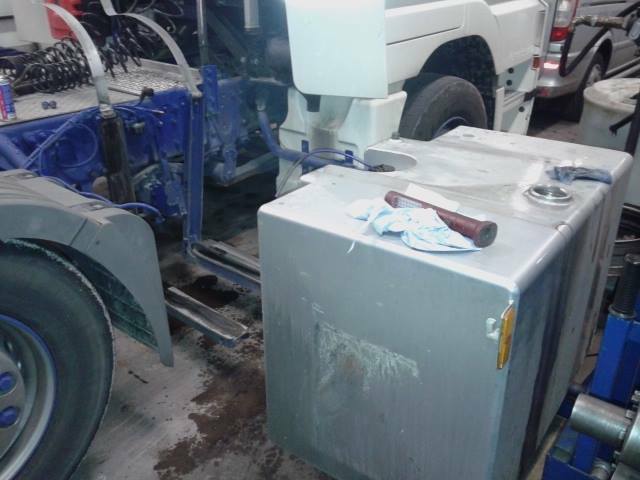 i though this issn't gonna work within time,picking it up take a long time (many trucks) but the rest of the evening went well,and maneged to came back at ht emercedes garage with just 2 minutes over my working time. the plan was to come out of bed at 6am ,i had to discharge in Ermelo at 9am ,bud driving so early i would be there before 8am. set the mobile alarm and went to sleep (after looking dvd for 1 hour long) in the middle of the night i awake for a pie stepped out the cab and saw that the window was complete open at my side,didn't see it when i closed the curtains,meaning i was far gone that time i went to bed. next morning i awake look at the mobile which time it was,because it was light and still, no alarm. look what went wrong,didn't set the day for the alarm,did the time,but not the day,as i said i was far gone that evening. so peddle to the metal on my way to Ermelo,and arrive at time,discharge the load of empty new big bags and back to Rotterdam. if i knew that before i make sure that i had lost that container,discharhed it too,back to rotterdam drop of the container,switch again with my own chassis and pick up 2 containers. container not from the vessel yet. so i could go home and get them theusday.now it was early so drove to the truckwash cleaned the truck,made another call if the container was from the vessel yet? went home, tyred as a dog,but a long weekend for resting. we have timber trucks here in holland,also production forrests. not in the scale as in Scandinavian though. in this German case,the most of the forrest was blown over in a storm,and later in a different storm the rest. 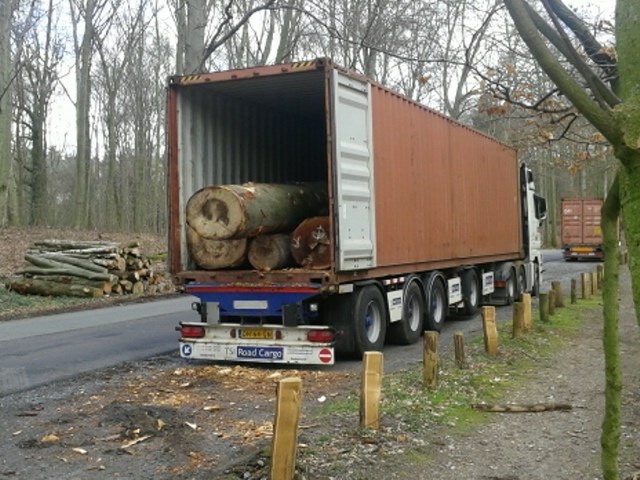 It just seemed a bit complicated to put logs INTO a container. Ain't there any "open" container frames or flatbeds available? ah that way,i thought you was reffering to the lumber/timber truck. to use a standard container is the cheapest way,it's just a steel box ,all around. using a flatbed they need to place steel poles at the side ,prefenting the logs for falling off the flatbed,they also have to strap them with steelcables or Ratchet straps. for using a OT (don't stands for ''off topic'' ) a Open Top container, the same steel box,exept the roof,which is covered by a sheet and steel bars. (light material,they are just there for keeping the sheet flat) but issn't that strong like a standard box.if they load it,and the side bend you never get the bars on the foorback and probally also not the sheet back in a way that you can place the line back in.